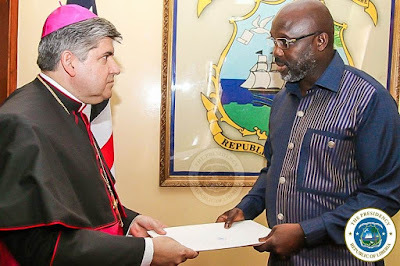 MONROVIA – As he received Letter of Credence from a Vatican Envoy, the President of the Republic, H. E. George Manneh Weah, has acknowledged the meaningful role the Catholic Church continues to play over the years in Liberia. President Weah specifically pointed to the Vatican’s continued prayers for peace and prosperity on behalf of Liberia, which has led to stability and national harmony. Receiving the Letter of Credence from Ambassador Rev. Monsignor Dagoberto Campos Salas Monday, December 10, 2018, the Liberian leader thanked the Vatican for the good job it has done in Liberia. He recalled how the Vatican, through Catholic Church, has been standing with Liberia since the days of the late Archbishop Michael Francis. 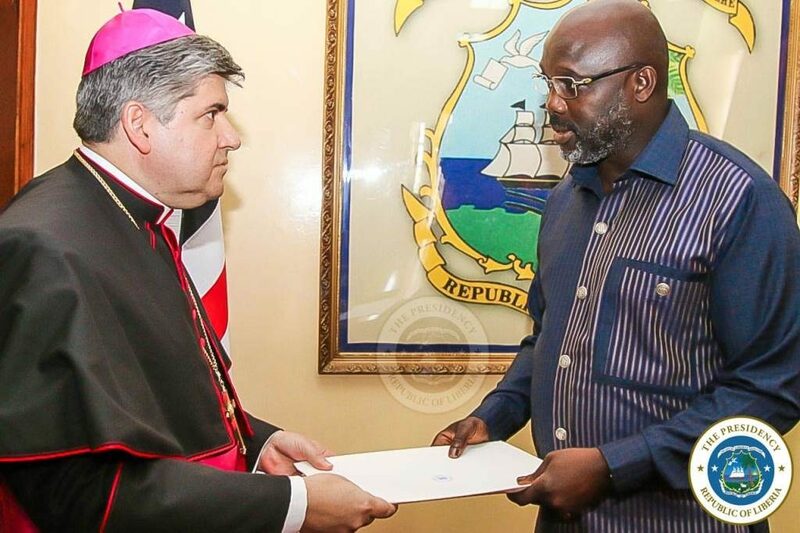 President Weah told Ambassador Campos Salas that Liberia still needs prayers to be able to overcome challenges facing the nation and its people. He said he has had longstanding relationship and strong belief in the Roman Pontiff in whom he still cherishes. He recalled the intervention of late Pope John Paul II when AC Milan, the team he played for in Italy, was struggling in the league. “So we believe in the Pope. And I still hold onto that. Even now in Liberia, with the help of the Vatican, we will able to overcome,” he said. The President said there was a strong need for Liberia and the Vatican to work toward strengthening the longstanding relationship they share. For his part, the Apostolic Nuncio said he was glad to be in Liberia and to present his Letter of Credence to the President on behalf of the Vatican. He thanked President Weah for his ascendancy to the highest office of the land and for ably steering the affairs of the state. He also extolled the exceptional relationship between Liberia and Vatican through the Catholic Church and noted government’s continued support to and cooperation with the Church. He expressed the hope that relations will blossom during his time as Ambassador of the Vatican.